I wrote this review in 2012, expecting that the film would eventually be released theatrically. It never happened, I’m publishing the review now. To my knowledge, this Italian film isn’t available with English subtitles. The first two scenes lead you to believe that you’re about to watch a droll and very funny dark comedy. First, as the opening credits roll, we listen to a radio talk show where people worry about how the coming aliens will affect the Catholic Church or a local soccer team. Then we watch a very shy, awkward, deeply repressed man visit an aging prostitute in what appears to be a furniture store. Since he’s only a waiter, he’s not allowed to use a bed designated for more successful professionals. For the first half of this unclassifiable Italian feature, the aliens are just background noise. Everyone knows that they’re here, but no one seems to know anything about them. Charlatans are making fortunes spinning their absurd tales about the new visitors. 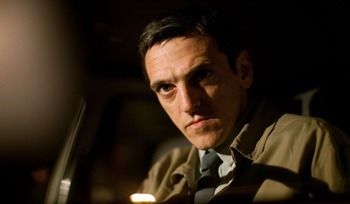 But the film is far more concerned with Luca (Gabriele Spinelli), the repressed waiter. Luca is an emotional mess. A loner with only one friend (a transvestite prostitute), he can barely talk to his co-workers. He spies on an attractive female neighbor, and is utterly revolted when she passionately kisses her boyfriend. He occasionally visits his father, who lives by himself on a small, nearby farm. After awhile, the aliens start appearing. And they look exactly like the most clichéd aliens imaginable. Worse, they look like people wearing badly-made alien suits. I don’t know if this was a creative decision or the result of a too-low budget. The first alien, clearly a female, turns up at Luca’s father’s farm, and becomes a chauvinist’s idea of the perfect wife–keeping a clean home and cooking fantastic meals. Better yet, she understands Italian but never speaks. That’s fine with Luca’s father, who’s no feminist. Indeed, in their scenes together, you can clearly see where Luca’s own mixed-up and arguably misogynistic attitudes about women originated. As the aliens become more involved with human activity, they seem both loving and vengeful. They cure the sick and even the dead, and attack the evil. No one knows their ultimate plan. But the aliens here serve the same purpose as the ones in Slaughterhouse-Five. They’re a form of fantasy relief (as opposed to comedy relief) in an otherwise grim and realistic story. Starting out as a comedy, The Last Man on Earth becomes quite serious, and contains one scene of shockingly horrific violence. With all of its conflicting styles and approaches, the film never really comes together as a whole. And the big surprise revelation at the end (which no, doesn’t involve the aliens) seems forced and melodramatic. But the good scenes, and there are many, outweigh the weak ones.